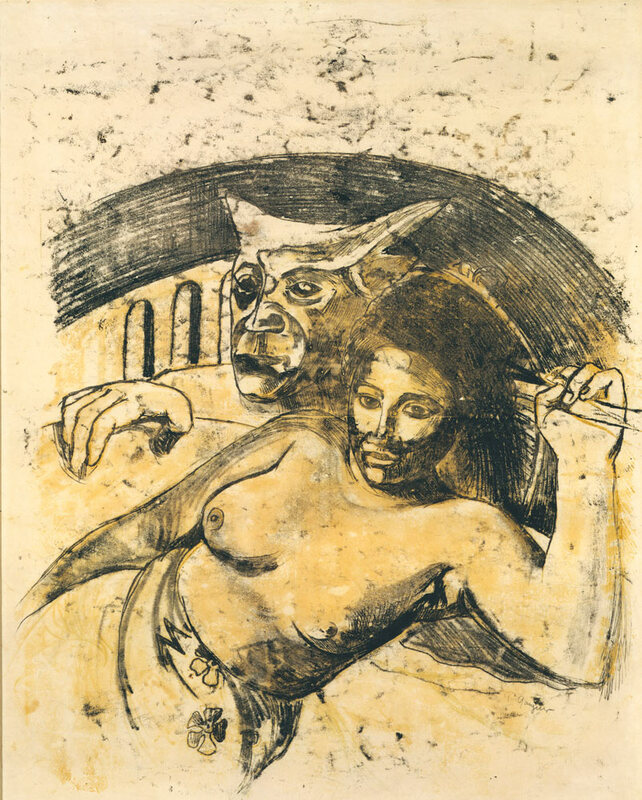 Paul Gauguin, Tahitian Woman with Evil Spirit, recto (ca. 1900), oil-transfer drawing, sheet 56.1 x 45.3 cm. Private collection. The Museum of Modern Art’s sumptuous “Gauguin: Metamorphoses” this past spring was the first large-scale exhibition to foreground the celebrated painter’s extraordinary graphic achievements and frame them within the context not only of his paintings but also of his woodcarvings, ceramics and writings. Organized by Starr Figura, the museum’s curator of prints and drawings, the exhibition comprised some 150 works, among them 120 works on paper and a selection of around 30 related paintings and sculptures, including five ceramic pieces and 18 woodcarvings. The astonishing array of zincographs, woodcuts, monotypes and transfer drawings that were the focus of the exhibition confirmed the artist’s position as one of the most expressive and groundbreaking printmakers of the modern era. Paul Gauguin made prints only sporadically during the last 14 years of his life, mostly producing them in sets at critical junctures in his career as graphic summations of his pictorial ideas. “Gauguin: Metamorphoses” chronologically traced the artist’s development as an experimental printmaker and featured his three major print cycles in their entirety: the Volpini Suite, a portfolio of 11 zincographs on bright yellow paper made in Paris in 1889; Noa Noa (Fragrant Scent), the set of ten innovative woodcuts made in Paris in 1893 and 1894 and intended to illustrate the publication of the fictionalized journal of his first Tahitian sojourn of 1891–93; and the Vollard Suite, a seldom-seen series of 14 woodcuts based on Oceanic and European themes mixed with local subjects that he produced in Tahiti in 1898–99. These three cycles were shown together with multiple artist’s proofs, related prints and woodblocks, allowing for a closer understanding of the complexity of his creative process.